Rolando Rivi: The testimony of the bloodied cassock. Contemporary historiography is always presenting more deeds of blood that involve priests and seminarians in the Italian post-war and of which the communist party was responsible. 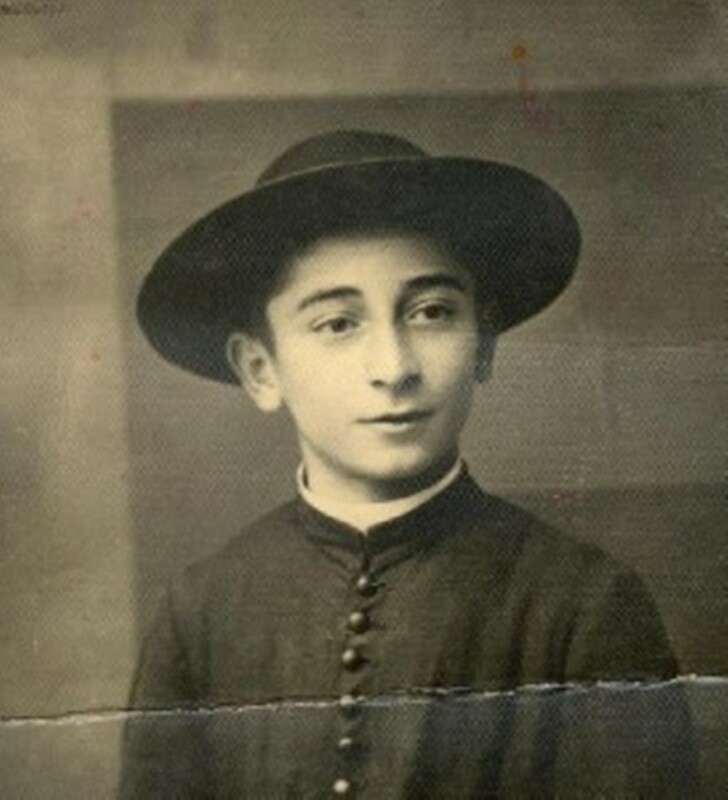 One very moving and particular example that is the young Rolando Rivi, selected, kidnapped and killed because of the cassock that he used to love and that he used to call the intact vestiges of Christ and because of his desire to imitate and celebrate Christ once he would become a priest. A small church of Visignolo di Baiso, in Emilia, upon the first mountain range of the Apennines, in a large picture frame of a crucifix surrounded by saints, there is noted the presence of a seminarian with the clothing and the hat of a priest. The painting was made 30 years ago by the pastor of the parish; he was convinced that the young aspirant to the priesthood would sooner or later become a canonized saint. His clean face and his vision is striking. It is the seminarian Rolando Rivi, one of the victims of the immediate post war, who happened to die just a few kilometres from this place as a result of the homicidal rage of the communist party members. The story was not spoken of until recently, but it is impossible to deny that the Emilia region was especially bathed with the blood of priests and seminarians, who were victims in that period of the persecution and hatred against Christ and the Church. The hatred which had spread during the war was still alive among many and was producing the death of many innocents, because of the ideology of class wars and the proletariat revolution made by a group of violent men, who even today, decades later are still celebrated even in school history books, as national heroes and liberators. Rolando Rivi was kidnapped, tortured and killed for his fidelity in the use of the cassock, which made such hatreds arise from the members of the party, making him a very vulnerable person and easy to individuate. They wanted to silence a future priest, but the eloquence of his martyrdom became an even stronger message after his death. Rolando Rivi was born in San Valentino in the Emilia region January 7th, 1931. His parents, Roberto and Albertina Canovi were humble farmers whose only treasure was the faith. He was baptized the following day and he received the second name of Maria because in the last part of the Rite he was entrusted to Our Lady. After the transmission of physical life, the supernatural life received in baptism was the greatest gift he received from his parents. It was a simple gesture, but it was animated by a correct sense of Christian doctrine and by a strong faith that was able to recognize original sin and its consequences together with the justification and sanctifying grace received in baptism. The pastors of St. Valentino, Fr. Luigi Jemmi and later Fr. Olinto Marzocchini had the privilege to form a generation of their parishioners in doctrine and Christian piety. Their apostolate was fruitfully fed by a rich, transparent interior life and perceptible also to the eyes of a child. He gave everything of himself with the intention of guiding his people to the Christian life; he was very active with the Catholic Action movement, distributing the meetings on different days so that different categories of people could participate; his presence among children and young people invited them to an intense life of prayer focused on the Eucharist and Mary; his catechesis to the adults every Sunday afternoon was very frequented; the charity that he used to exercise toward the poor people; his continual availability for confession and spiritual direction, his constant visits to sick people; his long prayers in front of the tabernacle, where even in late hours, he stayed awake praying for his parishioners, especially those who were killed fighting in the war. The most beautiful memories of his childhood (Rolando remembered) were when he used to help serve the mass as an altar boy. He was deeply touched by the words of the priest. Brief homilies, but directed to the heart, messages that really made one consult, question and reflect about the sense of existence and eternal destiny. When he was just eleven he entered to the diocesan seminary of Marola. It was October 1st 1942, that same day as was the custom; the young man wore the cassock with happiness for the first time. Guided by his spiritual director Fr. Alfedo Castagnetti, he entrusted his new life to Our Lady in the month of October that is dedicated to the rosary. Actually in that year it was the 25th anniversary of the apparitions of Our Lady at Fatima (1917-1942). The Rector Msgr. Luigi Bronzoni, a very educated priest, authoritative and paternal, used to teach more by his life than with words, offering a healthy example of love towards God and towards each one of the boys entrusted to his care. When vacations were approaching he would explain to the seminarians that they had to be very careful not to associate with bad companions and occasions of sin, but moreover they had the obligation to distinguish themselves by prayer and service in the parish, in study and in purity, in good works and dedication to the Lord. His cassock was not for him a human or social barrier for relationships with others. It was not an impediment for the development of his activities, even the recreational ones. The seminarian Rolando Rivi was a very active young man. A witness of this was one of his classmates from seminary, who is now a priest and pastor, Fr. Vezzosi: “Rolando was vivacious and smart in all the games: at soccer, at volleyball, he was the champion of the class. He was very attentive in school, an exemplary student, deeply in love with Jesus. Everything in him was a superlative, it was a big joy to be with him, he transmitted to all his happiness and optimism. After having “amazed” the kids of his town with his abilities and his virtues he used to propose to them: “Now let’s go to pray to Jesus in the church.” He took the opportunity to lead them to the front of the altar and teach them to relate to Jesus, who was his best friend. Everyone knew how affectionate he was to his cassock. He wore it always. It was very common to see him walking the streets of San Valentino, normally going towards the Church alone or with others, always smiling in peace, ready to say hello to everyone, always with his austere cassock. But not everything in his life was cheerful, carefree and worriless. In his personal and family life there was the reality of the Great War in which three of his uncles died. More than anyone else, he was the consoler of the heart of his grandma, who deeply mourned the loss of her sons. Another sad surprise arrived on the horizon…in September 1944 the seminary was occupied by a hundred German soldiers. The seminarians had to flee and return home. Rolando Rivi returned to his family in San Valentino just like his friends, but he brought books with him, intending to study Italian, Latin and Mathematics with the intention of not losing time, but waiting for better times. In his house he continued to feel like a seminarian. He was like a little twig flying around in a storm, his biggest joy was daily Mass and Communion, meditation, afternoon adoration and the rosary. His favourite place was the rectory. Besides sports, another passion of his was music. Whenever he placed his hands over the keyboard of a harmonium he was in ecstasy. Even the time of trial was for him peaceful and he always knew how to be happy. He was never an introvert in his seminary years, but always very friendly, alive and very sociable even to the point that everyone was happy with him. He was so amicable that everyone used to talk to him. He had contact with all the people and children of his town. In his house, in the afternoon, he used to lead the rosary together with his grandma Anna. To the children and little cousins and to those of five or six years old, he used to teach them to serve Mass and he would play with the smaller ones to create in them a sense of serenity on their sadder days. Rolando was very sure of his role as tutor, so to speak, in his relationship with the youth. The daily life in the town of San Valentino was very calm until the summer of 1944. After this many groups, Germans, fascists and partisans began to pass through. Many bad things began to occur, robberies and violence, even against the priests. The priest, a servant of the Gospel, became the true sign of contradiction before, during and after the war. Anyone who denied love made this witness of Christ the target of his anger. In this way hatreds were becoming stronger against priests, who worked for the pacification of souls and denounced violence from whatever source. The priests who were killed were the real friends of the people in the most difficult times, when there was lack of food, protection work and help they always offered everything, even depriving themselves of these goods. But the system of “Striking the shepherd that the sheep may be dispersed” (Zc. 13,7) is characteristic of the enemies of God from any country or any race. Rolando was a witness of these events when he was insulted by the communist partisans who were passing through the mountains. Rolando perceived everything and suffered without allowing himself to be weakened by anyone, he was really proud to belong to Jesus and of the fact of having been chosen by him for a very important mission. He continued to be the good and sociable young man that everyone knew. In his simplicity he believed in the goodness of everyone, it seemed impossible that anyone was able to do something bad. In San Valentino, the pastor Fr. Marzocchini, the one who was a strong inspiration for the vocation of Rolando was targeted. One morning, it came to be known that during the preceding night the priest was humiliated and suffered a beating. They robbed everything, even the shoes he was wearing. During the mass that he celebrated after the brutal aggression, Fr. Olinto was feeling ill: Rolando and the other altar boy serving Mass understood that something bad had happened. When Rolando came to know what happened, he felt this like an offense against his own father. He did not say a word of hatred against the partisans. In the meantime that Fr. Olinto Marzocchini was moved to a more secure place, a very young priest, Fr. Alberto Camellini age twenty five, arrived in the town to provide his priestly service. The seminarian did not hesitate to explain what his future plans were (…I will be a priest and missionary). As well he was very open showing his heart, his love for Jesus Christ, the Church and even his vivacity and his talents together with his musical gifts. Fr. Alberto began to know him and to appreciate him. Everyone used to see the young seminarian walking in the streets, everyone knew his life style, he was known as: “The little priest.” His parents used to tell him: “Don’t wear the cassock, at least don’t wear it during these times…” They used to explain that it was not prudent to wear it in such unstable moments. Belong to Jesus, belong only to Jesus, It was the only desire of his whole existence to belong only to Jesus every day. “Jesus of my life. Jesus of my heart” he used to write. He was always ready for Jesus, not only to work hard for him but even to sacrifice himself. It is true that this clothing which symbolizes the eternal God and Christ, who is the savoir and judge, was a motivation of hatred for those who wanted to know nothing about it. It is a motivation of hatred even today. It constricts those who just want to speak blasphemies and forget whatever they have said. Notwithstanding the risk, Rolando did not ever want to take off the cassock, but for him it already meant a lifelong duty. He really loved that cassock. To wear it was for him a true honor and a glory. It was like an open declaration of love and belonging to Jesus. It was clear for him what it meant in that time to prepare himself for being a priest. He knew that the future was not supposed to be easier. But he was not discouraged nor closed in his house, he was without fear. We can say today that he really showed his love to fulfil the mission, walking around the town with his cassock very visible in his unique style and clear identity, always in peace. Even in that horrible, unsafe environment, he continued wear his cassock. He was only fourteen years old, a little older than a child, but he never hid his clear identity of being a passionate aspirant to the priesthood. He continued wearing the black robes and the biretta. In a very instinctive way he already knew that to camouflage oneself harms the apostolic work in which signs and symbols, in the same way as gestures, are a very important part. Yesterday like today, the ecclesiastic habit is not indifferent both to the user and the one having seen it. It may not be hated in itself, but because of the deepest reality that reminds people of something they do not always like. It can be rejected because of requirements that it carries for the one who wears it and who has to become a witness of coherence and who has to be a worker before God and men. If it doesn’t produce admiration in everybody, it causes respect, because more so in hostile environments to Christianity, it is a sign that the one who wears it serves a reality that he believes more than using it to his advantage. In the same way he used to defend the pastor, Fr. Marzocchini from calumny provoked by the communist partisans. He was known for his faith and courage; he was admired but as well seen in a bad light, because openly he showed that he wanted to become a priest. On April 10, 1945 on the morning of the Tuesday after Low Sunday, he was already in the Church. He was happy because he already received communion, he didn’t know that this was his viaticum. He went back to his house and bringing with him some books, he went to the forest to study. As usual he was wearing his cassock. “DO NOT LOOK FOR HIM HE IS COMING WITH US FOR A LITTLE WHILE.” – The partisans. His father and the priest Fr. Camellini were looking for him everywhere. The partisans had taken him to their base in the Emiliano Mountains. They took his cassock which made him very upset. They insulted him and hit him on his legs with his belt. Right now in front of them, they had a small child covered in wounds and crying. In fact these same things happened to Jesus. For three days Rolando was in the hands of those godless men. Mountains of blasphemies and insults against the church and the priesthood and other kinds of vulgarities fell on him, the poor little one. In this way the fear of flagellation in the poor body of this child became his own way of the cross. Rolando was innocent, crying and whimpering like a little lamb taken to slaughter, he prayed from the depths of his heart and he asked for mercy. Still his soul was possessed by Christ and he was strong and in peace. Someone really touched by this testimony suggested to allow him go because he was just a child and there was no real motivation behind killing him. Nightfall came and they took him, bleeding into a forest in Piane di Monchio (Modena). He knelt next to the grave pit and he prayed for himself, for the people that he loved and possibly for the assassins. Two revolver shots sent him to the earth in his own blood. One last thought and one last beat of his heart for Jesus, he was completely in love…then the end. The partisans covered him with shovels of earth and some dry branches from the trees. His cassock became a soccer ball, later seen as a “trophy of war,” under the door of a neighbouring house. It was April 13, 1945, the anniversary of the young martyr St. Ermenegildo (+585 A.D.) Friday, like the one on which Jesus gave himself on the cross. Rolando was 14 years and 3 months old. On that bloody day, Fr. Alberto Camellini went to see the diocesan bishop, Eduardo Bertoni. The partisans who hated the Church and the priest thought that for Rolando everything was finished with the two shootings and with the shovels of earth that were thrown on his martyred body, in the grave in the forest of Piane di Monchio. But no, this was just the beginning. It is the message of Rolando that like a living seed bears fruit and is being fulfilled. Rolando Rivi lived only fourteen years, he lived only to become a priest, to celebrate in the altar and offer the Holy Sacrifice of the Mass and to announce to his brothers, like a real missionary, the real Jesus Christ. There is an empty altar in which this young man never celebrated the Mass, but there are so many other youths that have been called to the priesthood and with enthusiasm, driven by this example, will celebrate on this same altar. (Vatican / Reggio Emilia) On Maundy Thursday Pope Francis approved the beatification of 63 Catholics, among them are also martyrs of the Spanish Civil War. Along with those who will soon be beatified are included Rolando Rivi, a young Italian seminarian of Castellarano in the Emilia region, on whom Giovannino Guareschi has also based his Don Camillo. Rivi was shot on 13 April 1945 because of the anti-religious hatred of Communist partisan in the province of Modena. The young Catholic who had come from grade school to the small diocesan seminary, died at the age of only 14. His killers had kidnapped him during the end of the civil war raging in northern Italy in the mountains of Emilia during the Second World War. What now in the history books is usually glorified uncritically as the “Resistance,” is presented as a resistance against the “Nazi-fascism”, that the fight against the German occupation forces and against Italian fascism was in fact in some areas of northern Italy, a civil war in which it came to who would hold the power in the postwar period. The Communist partisans took up arms, not only against German troops and Italian Blackshirts, but for the establishment of a Soviet Republic with the dictatorship of the proletariat and thus against all non-communists, including especially the Catholics. Left historical misrepresentations are addressed and overcome. The “Resistance,” was understood by many Communist brigades as the spark for a communist revolution, also in Emilia. Therefore Rolando Rivi only a 14 year old boy, had to die, and with him, dozens of priests and religious, who were brutally murdered in the “death triangle” of Emilia. Not because they were suspected to have been fascists or had fascist friends, as Leftist historiography and “partisan tradition” would like to tell it, but because they defended the Catholic faith, which the Communist revolutionaries wanted to eliminate. The beatification process had entered eight years ago into the decisive phase after two dioceses, those of Modena, where the martyrdom took place, and that of Reggio Emilia, the home diocese of Rivi, completed the preliminary investigations. In 2005 the two dioceses promoted the cause from a joint committee, in order to promote the causa. His greatest desire was to become a priest – grown reverence among believers in the Pacific. The admiration for the young seminarian was in the religious people has grown over the years after the war during the peace. Publicly it was by grace, miracles and healings, whose testimonies were collected from the two dioceses. From different countries today, the faithful flock to the hills of the Apennines to the Romanesque church, in which Rolando Rivi lies buried. Pope Francis recognized with his signature on Holy Thursday, that the young seminarian was not murdered by the Communist partisans for political reasons, but in odium fidei, out of hatred for the faith. A decision that is to challenge in those events and help to ensure greater attention in the post-war period “canonized” by Leftist historical misrepresentation. It is therefore an important signal that the first choices of the new Pope’s beatification of Servants of God were killed by two different totalitarian ideologies which were yet opposed to God, which rocked the 20th and persecuted the Church. Among the 63 Catholics whose beatification Pope Francis signed, there is also the Dominican, Father Giuseppe Girotti, who was killed in 1945 in the concentration camp at Dachau. Archbishop Luigi Negri of Ferrara said after learning of the beatification: “The meeting with Rolando Rivi meant in my life, the encounter with the experience of a radical adherence to Christ and to the Church, which dominates the boy’s age and state wide. A faith in granite, a simple but robust faith that allowed him to stand faithfully and firmly even before the outbreak of the wildest anti-Christian hatred, with humility and realism. Evidence which is also aimed at the youth of today and certainly not unheard of today” says Monsignor Negri for the Nuova Bussola Quotidian. Rolando Rivi is in fact already beatified with the papal signature. In the coming months, however, a solemn Rite of Beatification will take place in Modena, where the Prefect of the Congregation for the Causes of Saints will read the decree of the Pope. Rolando Rivi is the first Italian Blessed, who was in a junior seminary and the first among the 130 priests and seminarians who were killed during the Civil War with Italian Communists.